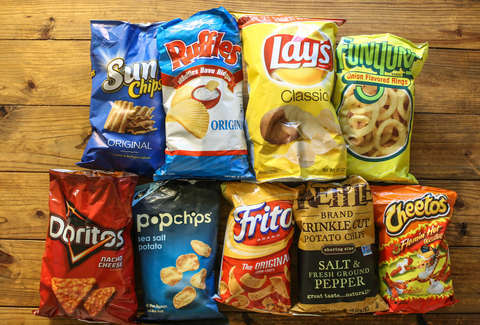 Since there are perhaps no greater pursuits in life than science and snacking, we set out to investigate the contents of our favorite bags of chips. How many chips are actually in there? Are there more than the nutritional label claims? How many are broken? And just how much does each chip cost? Science! These pressing questions led us to purchase two bags of each of the following brands: Fritos, Cheetos, Doritos, popchips, Ruffles, Lay's, Kettle, Funyuns, and SunChips. During transport I treated the chips with a care that I usually reserve for egg cartons, and, although I'm sure one or two broke along the way, the breakage would have been consistent across all bags and thus cancels itself out. Here are the results of this great experiment. My methods for counting may not be accepted by the Board of Snack Chip Statistics and Research, but mostly because it doesn't exist. To count the chips, I considered a whole chip anything significantly more than a half chip. When counting broken chips, I took the shards and crumbs and grouped them into the size and shape of a whole chip. Although our sample size was only two bags, my methods were consistent throughout, and, let's be real, it would take a crazy person to count out more than 608 Fritos. Although they have significantly less writing, chip bags are a lot like books: you shouldn't judge them by their covers. Or rather, you shouldn't judge them by their nutritional labels. For this graph, I measured the actual number of chips (the dark lines) versus the stated number (light lines). 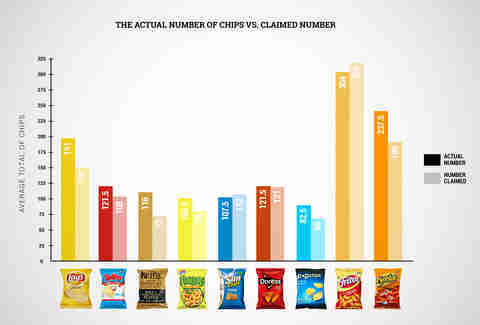 It's important to note that each chip manufacturer uses a different bag size (perhaps to discourage tests like this one! ), so it's best to remember that the important relationship in this graph is the comparative ratio of actual to stated, not the total value based on number of chips (we'll get to that later). The most accurate brand in terms of chip number is Doritos (merely a half-chip difference! 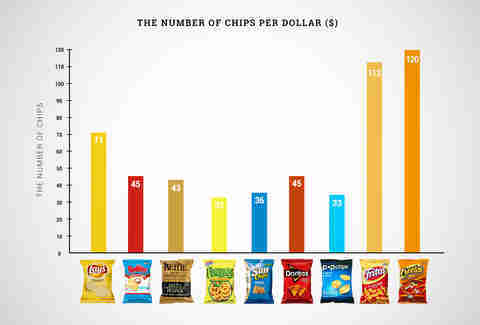 ), but Lay's and Cheetos also deserve a paw-shaped pound for giving their customers the most bonus chips. Counting out broken chips made me feel a little like a snacking archaeologist. When piecing together the history of these chips, I could find some clear breaks where two halves were definitely part of the same whole, but I didn't get that meticulous about it because I didn't want to feel like a snacking puzzle putter-together-er. The main takeaway from this was that when it comes to breakability, size and shape matter. 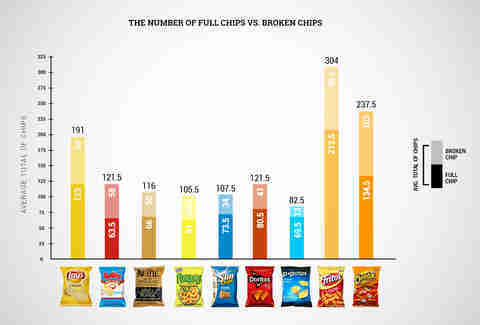 The popchips had the lowest ratio of broken chips, partly because they're small and circular. Ruffles, on the other hand, are basically perforated, and therefore have a much higher chance of snapping. This graph is all about value. This number likely changes based on bag size, but each of these was the brand's larger offering (but not feed-an-entire-Super-Bowl-party-sized). Since showing the cost of a single chip would require a really small scale (like tenths of a cent), we charted how many of each of these chips you get for $1. 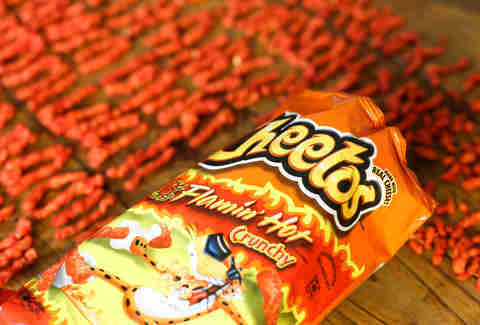 Judging purely on number of chips, Cheetos is the clear value winner at $.008 per chip. But when considering bang for your buck, you've also got to think of size and shape, in which case Funyuns' more expensive rings might just be worth those three pennies a pop. Although declaring Cheetos the king of all snack chips would make for some fun drama, it's hard to say there were any real winners or losers in our test. Each of these chips is a totally different beast, so we were very much comparing figurative apples to oranges -- or curls to gigantic puffed onion rings -- but that's not to say there weren't some interesting takeaways. There were! And we've put them in the above graphic. Dan Gentile is a staff writer on Thrillist's National Food and Drink team. After all 2,774 chips were counted, he gave them to homeless people, along with some fancy bottles of water. Follow him to more snack-based altruism at @Dannosphere.